The fastest smartphone on the market: what makes the S4 tick? It's time to grab a slice of birthday cake and warm up those vocal cords as RAM has turned the ripe old age of 62! And my, what a way it's come since it's early incarnation on 11 May 1951. Without RAM, many of our day-to-day devices simply wouldn't function – from PCs and laptops to smartphones, tablets and games consoles. 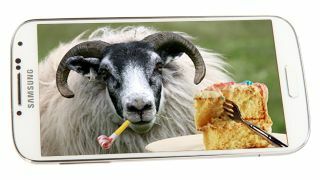 We've got a lot to thank it for, not least the power of the Samsung GALAXY S4, so we hope you'll join us in giving it the birthday celebration it deserves as it prepares to start drawing out of what we can only assume is a huge pension pot. RAM, or Random Access Memory to give it its full title, allows devices to access chunks of memory without having to file through the chronological storage method which hard drives use to hold data. This means RAM can offer up information at much faster speeds, although its capacity is much lower than your main storage device and all data is removed when the device is switched off - with all your data saved on the main storage. Adding more RAM to a computer (or similar device) will allow it to process more information at once, therefore increasing the amount you can use and radically improving performance. The date is 11 May 1951, the location is the Massachusetts Institute of Technology and Professor Jay Forrester and a team of researchers have just produced something dubbed Project Whirlwind. This project came about after the US Military decided it required faster computing power so it could run real-time flight simulations, and though Project Whirlwind never made it into any of those simulators, the foundations for RAM as we know it today had been laid. Technically Random Access Memory had been around before 1951 – with cathode ray tubes being used to store electrically charged bits of data - though Whirlwind was where RAM became reliable, practical and speedy. Fast forward 60-odd years and you'll find RAM rapidly accelerating, with the technology getter smarter, faster and smaller, thus giving devices such as the Samsung GALAXY S4 and the rest of the GALAXY range the capability to deliver blisteringly fast speeds before your very eyes. There was a time not too long ago when 2GB of RAM in a PC was seen as cutting-edge, but we're now seeing that sort of power in smartphones, along with quad-core processors making their way into devices which fit into the palm of our hand. Samsung has always been at the leading edge of technology and RAM is no exception, with the GALAXY S4 sporting 2GB of the latest LPDDR3 RAM, allowing you to use the handset in ways that were never possible before. The benefit of having a large chunk of RAM on your GALAXY S4 is simple. It means you can have more apps open in the background, reducing the endless opening and closing cycle, and allowing you to get on with your life without being forced to wait for your phone to load. As well as the cutting-edge RAM, the GALAXY S4 also packs a powerful processor punch with the choice of a supercharged 1.9GHz quad-core chip and superfast 4G network connectivity or a market leading octa-core option which harnesses the power of eight cores. This perfect combination of processor and RAM means the Samsung GALAXY S4 is ready to take on any task, and process it in a blisteringly fast time. The Samsung GALAXY S4 comes running the latest version of Google's mobile platform - Android 4.2.2 Jelly Bean. Jelly Bean has been specifically developed with speed and simplicity in mind thanks to Project Butter, and coupled with Samsung's intuitive TouchWiz user interface and the power under the hood the GALAXY S4 provides you with one of the best smartphone experiences going.